The BICfB consortium has studied the development of institutional repositories in the Belgian French-speaking universities and the active involvement of our teachers and researchers (as editors in chief, members of an editorial board, peer-reviewers, etc.) in the life of academic and scientific journals on Open Access, or at the least freely available on the web. 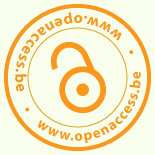 According to that study, ORBi, the IR of the University of Liège, counts for 2/3 of the Open Access publications of the Belgian French-speaking universities. The study can be dowloaded at http://orbi.ulg.ac.be/bitstream/2268/124876/1/Open_Access_en_Belgique_francophone.pdf.